Summer might be over, but idols are forever! Get ready to make a splash at your next anime convention when you cosplay Love Live! Sunshine!! with one of our wig recommendations below. Our Chronos style falls just past the chin, making a perfect and practically effortless wig to use for Chika. For a few more inches, our Aura style works just as well! These wigs are incredibly thick, leaving plenty of room for her braid and ahoge to be styled in. Our vibrant Autumn Orange is the perfect color for this energetic idol. If that’s too bright for your style, you can also use our warm and light Cocoa Brown to suit your interpretation. With some heat-styling, our curly Diana style can easily be straightened into You’s wavy swimmer style! Or you can go the opposite direction and add in the waves yourself to our Aura style. Both styles come down to the shoulder, so length won’t be an issue. Go warm with our Ash Blonde color or a little cooler with Gunmetal Grey to suit your interpretation. For Riko’s long flowing hair, our straight 28″ Nyx style is a perfect fit. If you want to go even longer, our Persephone style boasts an even more impressive length of 40″. All of our wigs are made with silky tangle resistant fibers, so both lengths are easy and manageable to take care of. Our Dark Red is just the deep, luxurious tone for this modest idol’s hair. but if you’d like a pinker tone you can also try our Burgundy Red. For Kanan’s signature look, we recommend using our asymmetric Aphrodite which has long bangs at the front while remaining short in the back, making it easy to mimic a pulled back style using one of our 30″ Straight Clip-On Ponytails. With a little trimming, our Chronos can work just as well as a base wig. Both our Midnight Blue and Blue Black Fusion colors are perfect for this calm, cool idol. You can use our loosely curled Hestia style for Mari with a little trimming, but make sure to leave some left to create her unique braid and hair loop. Our Aura style can also be styled into waves with some heat-styling, though in this case we recommend making her braid a detachable piece instead with a pack of wefts in the same color as your wig. Our eye-catching Rich Butterscotch Blonde is just the color for this cheerful idol, or you can go for a more natural look with our aptly named Natural Blonde shade instead. 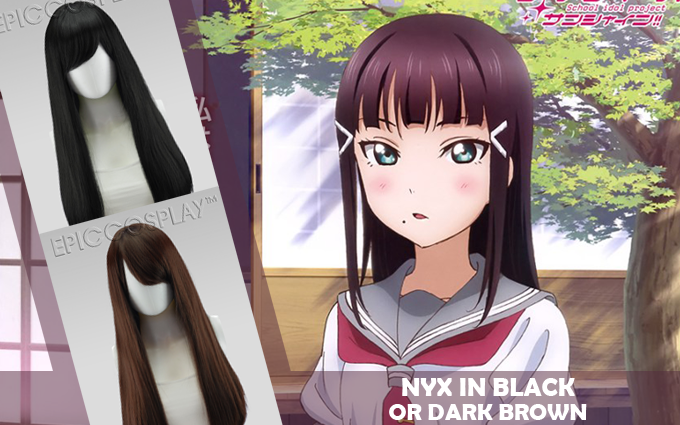 To create Dia’s perfectly maintained Hime cut, use our long and straight Nyx style! Simply trim the bangs straight across and clip the front to shoulder length and you’ll look just like this refined idol. All of our wigs are made with silky tangle resistant fibers, making them easy and manageable to take care of. Choose between an elegant pitch Black color or our slightly warmer Dark Brown. Our Iris style is long and wavy, making it perfect for Hanamaru with just a quick trim. You can also straighten our curlier Hestia style into the same flowing locks with a little bit of heat-styling. Both our Butterscotch Blonde and Caramel Brown colors work perfectly for this sweet idol. Our Chronos style is a cute and flattering bob cut that falls a few inches past the jawline on most wearers, with a natural curl to frame the face. After adding two of our 20″ Clip-On ponytails, this wig should require minimal styling for Ruby’s adorable hairstyle. Our delicious Raspberry Pink is just the shade for this cutesy idol, or you can go for a more natural look with our darker Burgundy Red instead. Although her style might seem strange, Yoshiko’s hair is actually very simple to replicate! Either our 28″ Nyx or 40″ Persephone will work as a long straight base wig and all of our wigs are made with silky tangle resistant fibers, so both lengths are easy and manageable to take care of. Then just add on one of our convenient Clip-On buns for an easy and removable styling option. Blue Black Fusion is the perfect deep, dark color for this fallen angel idol.